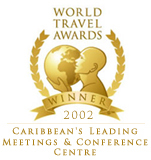 Whether planning for a small meeting or major event, the Jamaica Conference Centre can provide all the support you need. Let us take the pressure off and help you to execute a successful event. Having trouble getting the point across? We can help by providing the latest equipment and services to make your presentations more effective. Planning a multilingual conference? All five conference rooms are equipped for simultaneous interpretation of six languages. Feel free to provide your own interpreters or allow us to put you in touch with the right people.